This morning the laundry bag was full so we put our clothes into a washer at the Laundromat and went for a walk on the Apache Pier while we waited for them. A sign on the pier claims that it is the longest one on the East Coast with a length of 1206 feet. 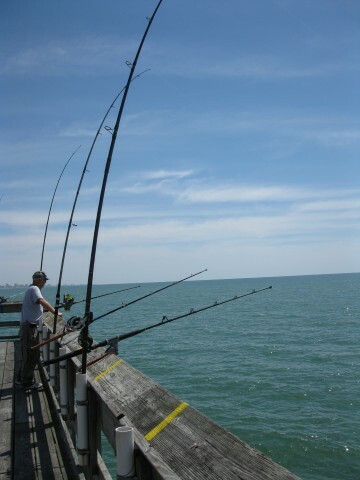 The railings were occupied by many fishing poles, under the control of men, women and even a couple of young boys. We chatted with a few of the men and learned that today was a slow day. 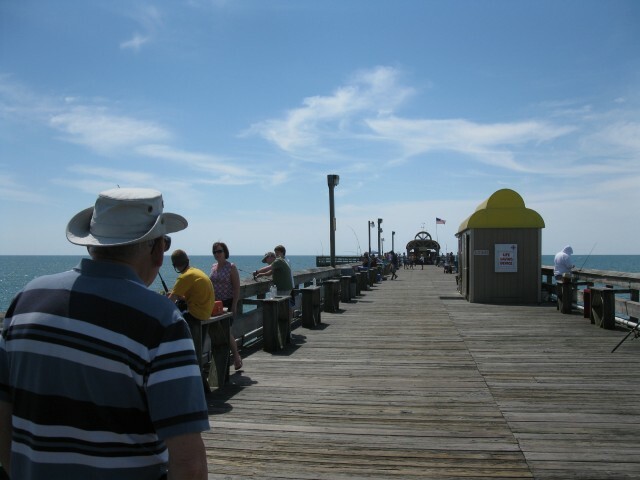 We were disappointed that we saw no fish being reeled in, but we learned a few things about the King Mackerel fishing, for which spaces were reserved at the furthest end of the pier. The view of the miles of ocean and beach was incredible too. 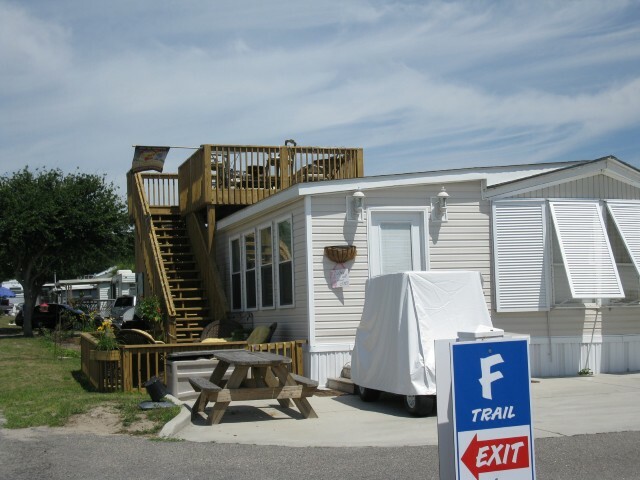 Some of the permanent trailers at this campground are very interesting and several have wooden decks built above the roof line, making great use of the small piece of land that they sit upon. After lunch we got back on the motorcycle and drove into town to see what was happening. Jim was disappointed to find that there were only a few parking lots occupied by vendors for Bike Week, and the number of bikes on the roads was surprisingly low. 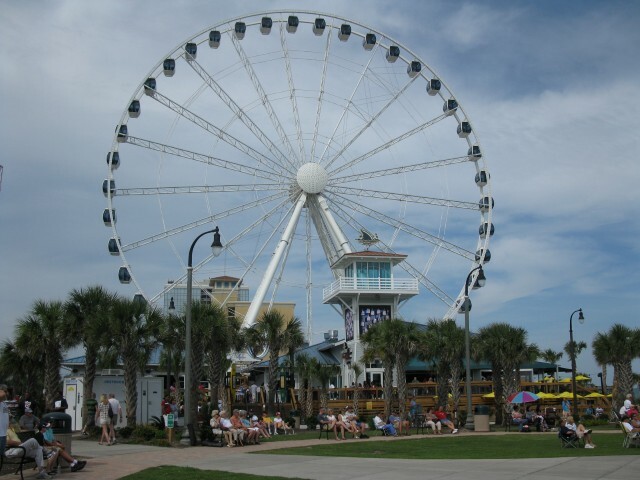 We were actually in North Myrtle Beach, so, after checking out the largest selection of vendors there, we headed to Myrtle Beach in search of more activity, but it was obvious that the bikers were being discouraged, at least from the residential areas. Every side street off the main drags had sandwich board signs at the entrance “No Thru Traffic.” The multitude of hotels and resorts along Ocean Drive, however, displayed signs welcoming bikers. Every one of them also had “Vacancy” signs and some offered rates of only $35 or $40 per night. If we’d had the stamina to ride the bike all the way here and stayed in one of these rooms, we could have had a much less expensive vacation. And still there were only small groups of bikers cruising the street or sitting in the outdoor bars. The sun was bright and warm. We parked the bike and wandered along the street, stopping to listen to music at the band shell, enjoying an ice cream cone and strolling along the board walk. Then we decided to check out the view from 200 feet up via the Sky Wheel which from a distance I thought was a Ferris wheel. It is the same concept, but the seats are enclosed in glass bubbles – no seat belts necessary. It moves slowly, allowing plenty of time to snap pictures of Myrtle Beach below. Back on the bike, we finished the drive along the coast on Ocean Drive, admiring the prosperous-looking homes that we passed. Obviously there are many people who are not affected by the recession. We stopped at Shorney’s for the healthy salad bar, and then called it a day. Note: Jim just found a message on the Myrtle Beach website that says the “Spring Ride” is NOT in Myrtle Beach, but in North Myrtle Beach, Murrell’s Inlet and Surf Side Beach. That may explain why there are so few bikes around here! Not like the last time Jim came down eight years ago. Perhaps we’ll be riding further south tomorrow. 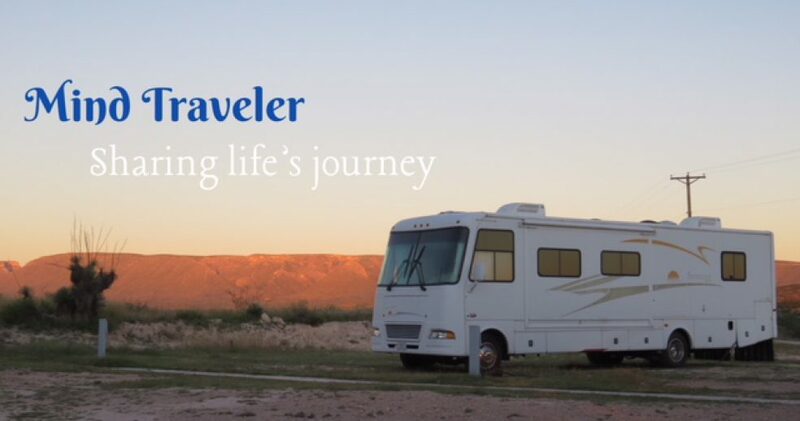 This entry was posted in Motorcycling, RV Travel, Travel and tagged Myrtle Beach, RVing, Sky Wheel, travel. Bookmark the permalink. I’d like to go on that Sky Wheel. Thanks, Karen. Sorry we missed that hockey game of Jordan’s. Sounds exciting.